Emotional Referral Zone 7 - Piedmont Physical Medicine & Rehabilitation, P.A. The seventh emotional referral zone is the connection to our spiritual nature and our capacity to allow spirituality to become an integral part of our physical lives. Seventh ERZ energy motivates us to seek an intimate connection to the Divine in everything we do. The seventh ERZ is the connection to our spiritual nature and our capacity to allow spirituality to become an integral part of our physical lives. While our energy system as a whole is animated by our spirit, this ERZ is directly aligned to seek an intimate relationship with the Divine. It is the zone of prayer. Achieve a personal relationship with the Divine. All physical, psychological and emotional illusions or fears need to be removed from your life. Let go of the past, do not anticipate the future and live in the presence of the Divine. 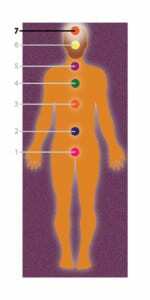 Energetic disorders, spiritual depression, chronic exhaustion that is not linked to a physical disorder, and extreme sensitivities to light, sound and other environmental factors. Ability to trust life, values, ethics, courage, humanitarianism, selflessness, ability to see the larger pattern, faith, inspiration, spirituality and devotion. Do you bargain with the Divine? Do you complain to the Divine more than you express gratitude? Are you devoted to a particular spiritual path? If not, do you feel a need to find one? Are you waiting for the Divine to send you an explanation for your painful experiences? If so, list them. How would your life change if the Divine answered your questions by saying: “I have no intention of giving you insight at this point in your life”? What would you do then? What spiritual truths are you aware of that you do not live by? List them. Are you afraid of a closer relationship with the Divine because of changes it might trigger in your life?